Additional Info: My name is Matthew Geer and was burn in Hastings, East Sussex. I currently study composition at the Guildhall School of Music and Drama, London under Laurence Crane (previously Dr James Weeks). Growing up, I achieved Grade 8 distinctions in Keyboard studies and Church Music studies. Throughout A Levels, developed a love for new music and received offers from the Royal College of Music, the Guildhall School and unconditional offers from top Russel Group Universities such as Southampton, Sussex and Sheffield as a composer and organist. 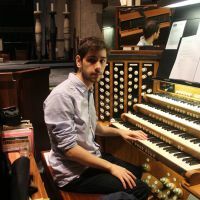 As an organist, I currently work as Director of Music at St Agnes, Kennington Park, an Anglo-Catholic church based near the Oval Cricket Ground in South London. I previously organ studied under James Lloyd Thomas (University of Sussex) and Paul Jeffery (King Charles the Martyr, Tunbridge Wells). I also work freelance in London, playing for weddings, funerals and services. I also have a particular interest in Choral music and, in 2017, founded the Guildhall Schola Cantorum. I now act as an accompanist for the ensemble and we have had bookings to perform at Cathedrals at Coventry, Guildford, Southwark, Croydon Minster, St Albans and Notre-Dame, Paris. As a recitalist, I was awarded an Oundle for Organists recital award two years in a row where I had the opportunity to perform at St Albans Methodist Church and St Peters church, Bournemouth. In 2018, my recital venues include St Stephens Wallbrook, St Peters Bexhill, St Mary Enfield, St Luke's Sevenoaks and my home church, St Agnes Kennington Park.